Synopsis: A teenage girl’s life is turned upside down after her cousin moves into her house, and as time goes by, she begins to suspect that she may be a practitioner of witchcraft. Review: I’ve said it before but man, I really miss the classic made-for-network-television movie that has long been extinct. I remember looking forward to all those Moment of Truth movies on NBC as well as the domestic thrillers, wacky comedies, and disease of week flicks that would show up anytime you were ready to change the dial. Without a movie studio behind them, so many of these films have been lost to time with many found only on YouTube in various degrees of quality. 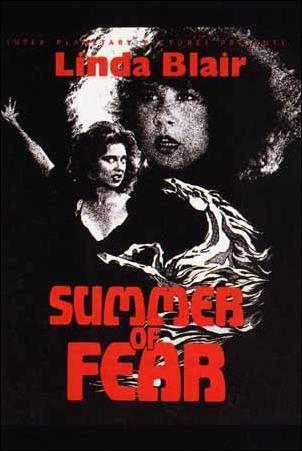 There is the occasional TV movie that drew the kind of viewership that allowed the movie to live on (often being released theatrically in Europe) and one such example is Summer of Fear from 1978. Originally broadcast as Stranger in Our House, the title was officially changed once the movie was granted a run in overseas theaters. It then made it’s debut on DVD before getting a nice treatment on BluRay in 2017. While it’s relatively vanilla for today’s horror audiences, it’s a fun little time capsule that has several impressive names attached to it. Star Linda Blair was a hot, if troubled, commodity when the movie went into production. An Oscar nominee for The Exorcist, she was also the lead of several notable TV movies which garnered her good notices. At the time, Blair was coming off of the much maligned The Exorcist II: The Heretic and some personal struggles when she signed on to star. Did I mention the film is an early effort from legendary horror director Wes Craven (Deadly Blessing, Nightmare on Elm Street)? Craven had directed a few intense adult horror movies before this and his overall restraint in the confines of television censors here is admirable. Based on the popular YA novel by Lois Duncan (who had a run of creepy books that were adapted into movies on TV and in theaters), Summer of Fear follows Rachel, a horse-loving teen in California that goes through hell when her orphaned cousin comes to visit and turns her life upside down. After her parents die in a car crash, mousy Julia (Lee Purcell, Valley Girl) leaves her Ozark home to come to live with Rachel and her family in their ranch house. Soon, Julia gets a make-over and starts to ingratiate herself into the lives of her family…to increasingly deadly results. Most of this comes at the expense of Rachel who loses her friends, her boyfriend, and her horse to Julia’s increasing grip over her life. Is Julia just a master manipulator or is there something more sinister going on? At 92 minutes, it feels like a full film meal and Craven often gives us a heaping plate of over-the-top moments. Blair has a knock down, drag out fight with someone and the stunt people look like they are wearing the exact same style wig. It looks like twins are fighting eachother. Purcell is also notable as the mysterious Julia. She’s evil, no doubt, but you aren’t quite sure if it’s just teen angst or if she’s harboring a darker secret. I’m surprised that this hasn’t had a remake, actually, as the story seems to be prime material to reexamine or reinterpret. As it is, the film manages to locate more than its share of creepy moments within it’s TV trappings and is quite worth seeking out. Synopsis: After her husband dies under mysterious circumstances, a widow becomes increasingly paranoid of the neighboring religious community that may have diabolical plans for her. Review: Hard to believe it now, but back in 1981 when Deadly Blessing was released director Wes Craven wasn’t nearly the household name he would become. Coming off of directing the intense The Last House on the Left and the bizarro The Hills Have Eyes (both of which would get lesser remakes decades later), Craven dialed down his extreme style for this moody chiller. Though not well received by audiences or critics, it was interesting to view this one for the first time. While Craven was never someone that was consistent from film to film, he had good eye and that’s what keeps Deadly Blessing afloat for much of its run time. Jim Schmdit (Douglas Barr) grew up as a member of the Hittites (think Amish) but left the religious community to marry. Inheriting a family farm, he’s returned with his bride Martha (Maren Jensen) much to the judgmental dismay of his father Isaiah (Ernest Borgnine) the elder in their order. When Jim dies in a suspicious accident his family that disowned him feels the land should revert to them and not to Martha. Martha intends to stay but when her two friends arrive for support and strange accidents start to happen, it’s up to her to find out if Isaiah is behind it all or if there aren’t more malevolent supernatural forces at work. I’ve mentioned before how much I frequented the horror section of my local video store as a child. I can still remember seeing the Deadly Blessing VHS staring back at me but, alas, it’s never one that made it home. 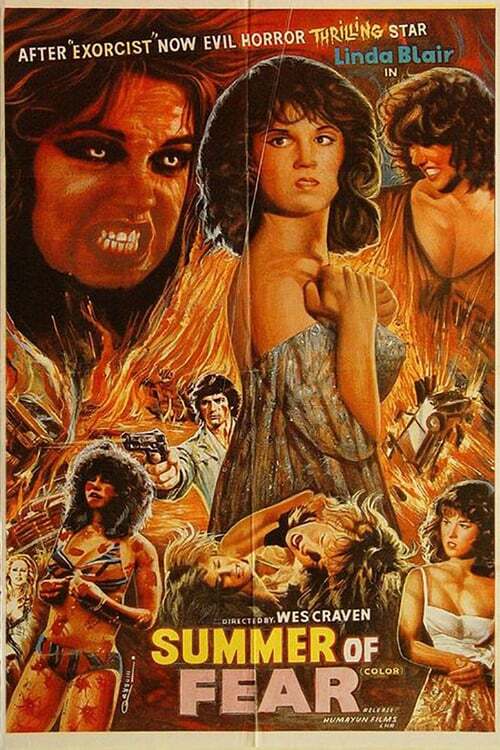 I actually think had I seen this as a teen I’d have been disappointed – back then I was all about the gore and high stylized horror flicks and Deadly Blessing isn’t overzealous with blood and guts. It’s more character driven than you might expect and while there are some tepid performances (Jensen is a snooze…a pretty snooze…but a snooze all the same) it’s a mostly well acted affair. Playing Martha’s best friends are a young Sharon Stone (Lovelace) and Susan Buckner (Patty Simcox in the movie version of Grease) and they are often the highlights of the film. Stone seems to go off the deep end pretty quickly (you would too if a giant tarantula fell in your mouth!) and never quite comes back from the brink which results in feeling like her performance is way too overbaked. That stands in stark contrast to Buckner’s nuanced take on the character – she’s a nice breath of fresh air and I wonder how much more effective the movie would have been if she and Jensen had switched characters. Craven stages some sequences with a nice amount of tension, like the scene where Jensen is relaxing in a bathtub and someone releases a huge snake into it with her. Though it’s almost a shot-for-shot preview of what he’d do three years later in A Nightmare On Elm Street (the snake head pops up between Jensen’s legs like Freddy’s glove does with Heather Langenkamp) it’s highly effective. I definitely subconsciously lifted my legs off the floor and tucked them in under me. There’s also a creepy scene with a couple attacked in a car and some nice point of view shots where we become the person stalking Jensen and company. The conclusion of the film was a genuine surprise and who (or what) is behind it all was kept secret right until the final reveal. Do you know how hard that is? Though it must be said that the good will is nearly ruined by a dumb nonsensical coda the studio insisted on, for the most part Deadly Blessing is a worthwhile look into Craven’s earliest work. Special mention for the spooky score by the late James Horner (The Magnificent Seven), a future Oscar winner. Another special mention for myself for never realizing until now that Stone is featured on the poster and not Jensen…sheesh…how did I miss that?